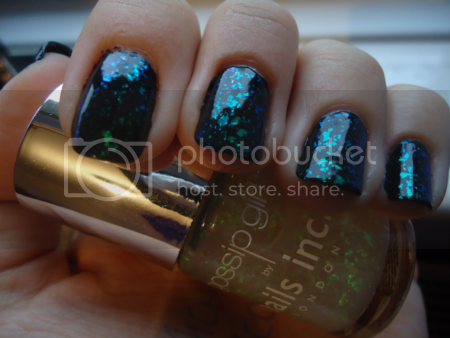 I'm a big fan of Gossip Girl so I was really excited to learn Nails Inc have released three nail polish duos inspired by the TV series, a solid lacquer and an 'overglaze' top coat. 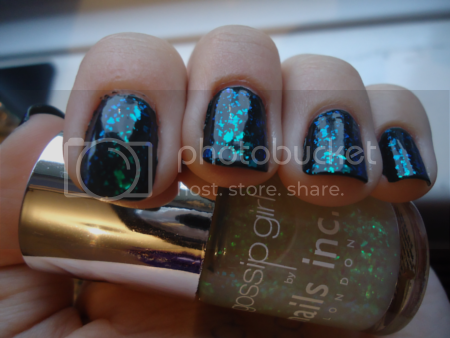 I was even MORE excited when I found out these top coats are actually flakie polishes. Nails Inc are doing flakes (yay)! 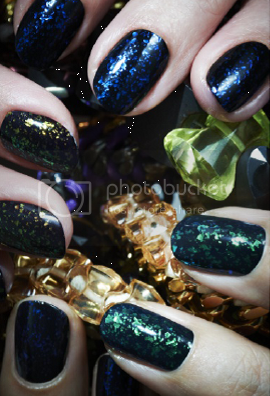 The duos are Blair (deep teal with a blue/green overglaze top coat), Serena (black with electric blue overglaze) and Lily (dark plum with red/green overglaze). The overglaze polishes are comprised of irregular opalescent flakes in a clear base. When I first heard of them I immediately thought of Nubar 2010 - of these, Lily sounds the most similiar to it - and as I already have 2010, I decided Blair sounded the most exciting. Plus, she's my favourite character. I forgot to take a photo of the teal base on its own, but I'm not sure it would have shown up very well anyway as it's so dark it almost looks black. 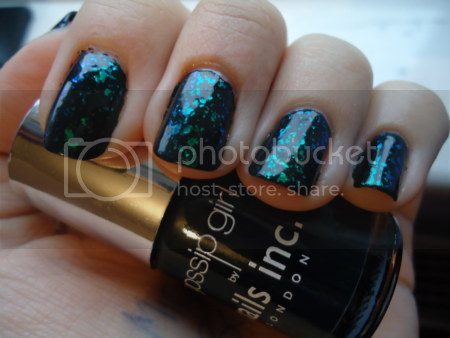 You can tell it's teal in the right lighting, though, and I actually think it would work very well on its own without the overglaze top coat, too. I did two coats, but it was opaque enough that one coat would probably have sufficed. The overglaze itself I did one coat of, and ohmygoodness it's beautiful! Isn't it lovely? I honestly can't stop staring at my nails. The flakes go practically the whole spectrum of blues and greens, from electric blue to turquoise to bright green. It's so pretty. 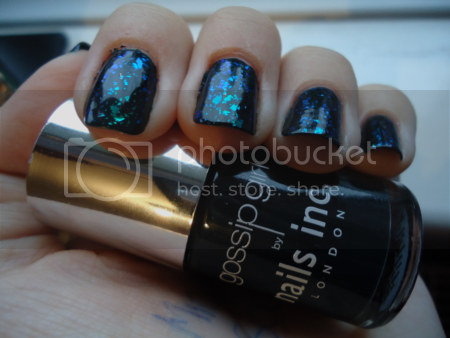 It makes my nails look lovely and shimmery, but the overall look is still dark enough that it's appropriate for winter. The formula on these was great. The teal base was perhaps a tad thick, but this didn't make it too difficult to work with. The overglaze went on perfectly. My only real complaint (as it usually is with Nails Inc) is the price. 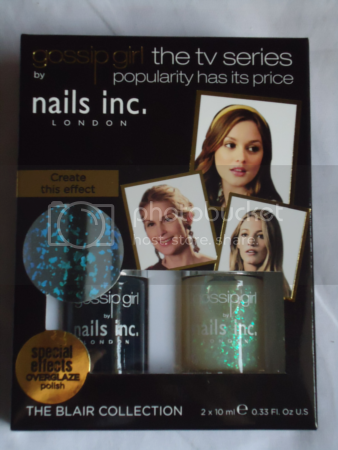 Each Gossip Girl set costs £20, which isn't cheap, although I'm tempted to say it's worth it because the overglaze top coat is so gorgeous. I'd love it if they sold these separately. Pretty please?